In the field of drug discovery and development, high-throughput suspension cell and bead screening is quickly becoming the platform of choice for biologics discovery, small molecule drug discovery, and adoptive cell therapy laboratories across the globe. A critical bottleneck in high-throughput/high-content screens is the data analysis following data acquisition. The copious amounts of data generated on each cell, and the number of cells that can be interrogated, presents difficulties with management, interpretation and conversion of the data into actionable answers. This webinar describes a reliable method for high-throughput data analysis by introducing you to a novel flow-based integrated platform ­– the Intellicyt® iQue Screener PLUS with powerful ForeCyt® acquisition and analysis software – that expands the analytical capabilities of flow cytometry by providing easy access to plate level analytics, dynamic profiling using multi-parameter data, and result visualization across all the plates in your experiments. 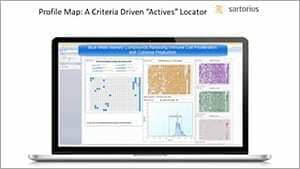 The webinar will cover examples of data sets from cell line development, IgG isotyping/titering, and immune cell assessment. Complete the form below to watch the full webinar and learn more.